SUMMARY: In the weeks following the deaths of Romeo and Juliet, the city of Verona is still being torn apart by endless fighting between the Capulets and the Montagues. Desperate for a solution, Prince Escalus arranges a betrothal between Rosaline (Juliet's cousin and the girl Romeo liked before Juliet) and Benvolio (Romeo's cousin and best friend) in the hopes that a marriage between the two houses will unite them. But Rosaline and Benvolio hate each other and resist the marriage with everything they have. IF THIS BOOK WERE FOOD, IT WOULD BE: Red onions. Lots of flavor, but the Shakespearean language will cause some readers to make a face. REVIEW: Romeo & Juliet is not my favorite Shakespeare play, but it is probably the one I know best. 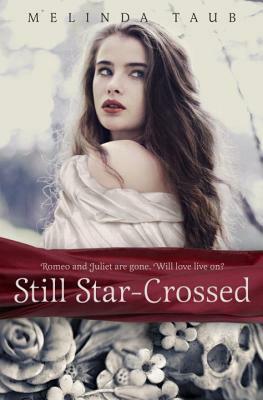 Still Star-Crossed does a fantastic job staying true to Shakespeare's original, especially in the way it is written. While I do think that is a good thing (and also says lots about author Melinda Taub's writing talent), I believe the flowery dialogue will scare off some potential readers. I love Shakespeare myself, but even as an adult with a degree in English, Still Star-Crossed isn't the easiest story to read and understand. As tough as Shakespeare is for me now, it was much, much harder when I was a teen. I never would have chosen this book for myself 25 years ago. I understand this story because I have scruntinized R & J for high school and college courses. I have seen tons of R & J spin-off movies and read lots of R & J spin-off books. All of these things give me a prior knowledge base that helps me understand character and language, which most teen readers will not yet have. It is well-written, but I got bored with the story at times. I skimmed some parts. It picks up when Rosaline and Benvolio make a pact to find a way out of their forced betrothal, but that's not until about halfway through. Action is sparse in places, and I wasn't sure if I was supposed to root for Rosaline + Benvolio or Rosaline + Prince Escalus. Readers who make it to the end will be rewarded with a sweet and satisfying story where roguish Benvolio becomes quite the swoon-worthy suitor. I also enjoyed the subplot involving Rosaline's sister Livia and County Paris, who was previously betrothed to Juliet. THE BOTTOM LINE: Still Star-Crossed is a well-written spin-off that complements Romeo & Juliet nicely. STATUS IN MY LIBRARY: On order. My students do sometimes request Shakespeare, particularly Romeo & Juliet stories, and this book would be an easy sell for those wanting to try it out.